The Land of my Fathers is a collection of stories, poems, songs, and paintings compiled by Morris and Lewis Jones. It was compiled as a gift book for children in which all the proceeds go to the National Fund for Welsh Troops. The book was published by Hodder and Stoughton in Britain in 1915; one year after war was declared but the first year that there was an exclusively Welsh army. All the works included in the book were created by British artists and feature themes of bravery and patriotism that are meant to boost the morale of the Welsh people who at this time were seeing their friends and family conscripted to fight in the war and not returning, as well as, watching their country be destroyed. The Land of my Fathers is a gift book of 128 pages filled with short stories, poems, sheet music (includes a melody and piano accompaniment), as well as, full colour paintings printed on high quality glossy art paper. Along with the edition found in Ryerson’s Children’s Literature Archive the editor of the anthology W. Lewis Jones in his preface describes a second edition created at the same time although the text was completely in Welsh instead of English. 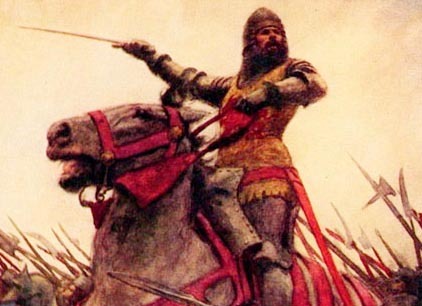 Some of the texts that were originally written in Welsh were translated to English to be included in the English edition of the book and some of the texts that were originally written in Welsh were translated to English to be included in the English edition of the book. The Land of my Fathers showcases the work of forty-three different authors and nine-teen different illustrators who were all British and Welsh. The book is an octavo size which means it is made up many sections of paper folded into six-teen pages and then bound together. The book attempts to connect with the patriot in each person, through the stories included in the anthology so that the person reading it feels compelled to assist in the war efforts by donating money. Since children are the most likely to receive gifts and are the easiest to influence it seems that marketing this book towards children would be the most effective at both raising money and boosting morale. Knowing what life in Britain and Wales was like in the years leading up to World War One greatly contributes to the understanding for the need of a book like The Land of My Fathers and shines light on why the government would be looking for extra ways of raising money to fund the war. It is also important in understanding the book. In this part of the exhibit I will go over some of the context that led to the publishing of this book so that the reader can imagine what life was like for people reading the book for the first time in 1915 as well as, the effect the book would have had on them based on the events taking place in Britain leading up to the publication of this book .The years leading up to 1914 and the start of The Great War saw tremendous change for Britain. The population was growing fast. This meant that the existing infrastructure was no longer efficient in caring for the English people, and their economic wellbeing. Therefore a need for England to expand their infrastructure arose. The result of this need was England’s industrial revolution (Gregory, Henneberg, 1). The building of factories provided England’s growing population with well-paying jobs and enough manufactured goods needed to take care of England’s large population. With Factories now operational and producing mass quantities of many different goods, England was in need of a way to transport these goods across the country as well as, to other nations for trading purposes. As a result England began building railroads, as trains are the easiest and most affordable way to transport goods across the country as well as transport goods to ports to be loaded on to ships to trade with other countries. The Factories and railroads that were built were essential in fighting The Great War. The Factories provided a place for weapons and ammunition to be manufactured, and the railroads were necessary in quickly deploying troops and sending goods to the front lines. Although these expenses proved to be very useful during the war it was a huge financial strain in the years leading up to The Great War and as a result took a huge toll on England’s ability to finance the war (Murray). 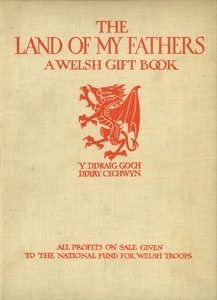 The financial strain that England was under meant that alternative fund raising methods were needed, publishers Hodder and Stoughton with British parliament member Lloyd George and his wife Margret Lloyd George decided publishing a gift book would be an effective way of raising funds for the newly created Welsh Corps. Margret George is the chairman of the committee of this book as well as, author of the foreword. Margret Lloyd George was the wife of Lloyd George, a Welsh member of the British Parliament. In 1915 when The Land of My Fathers was published Lloyd George was Chancellor of the Exchequer. He held this position from 1908 until 1915 when he elected as the British Prime Minister. George was Prime Minister of England from 1916 until 1922. During the time he spent as Prime Minister he led the British Empire to victory in World War One, rebuilt Britain and helped in reshaping Europe post World War One. In 1915 as Chancellor of the Exchequer he saw the importance of an authentically Welsh army and succeeded in the formation of the Welsh Corps (Barlow). The Welsh Corps who later turned into the thirty-eighth division. 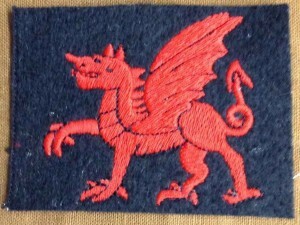 The thirty-eighth division was the first exclusively Welsh division of the British army, and were authentically Welsh right down to their uniforms that were locally made and featured a unique Welsh emblem (Baker). The creation of a Welsh army was important to Lloyd George because it helped to solidify the importance of Wales in the political environment, and was also an attempt to increase recruiting efforts by appealing to the Welsh people’s sense of nationality. The thirty-eighth division fought in France, and suffered great loss while defending the country (Baker). By the end of the war the number of Welsh soldiers who died reached forty thousand. A long with the devastation felt from watching friends and family conscripted to war only to die the Welsh people were also suffering from watching their country side be destroyed (Davies). With the Welsh people experiencing so much death and destruction it is no surprise that Welsh people had lost their sense of nationality which had been one of their proudest attributes. During this time it was impossible to walk through a town in Wales without being the target of for pro-war propaganda, and recruiting efforts (Barlow). With morale for the war so low and the government in need of funds there arose need to find alternative way to raise funds and nurture the spirit of the people at home. Publishers Hodder and Stoughton stated that while the army was fighting in France it was there duty to “boost morale and preserve unity on the home front.” Thus will the help of Margret Lloyd George The Land of my Fathers was created (Attenborough). The theme of children’s books and war is very present in The Land of my Fathers. The publishers had two goals in creating this book. The first goal was to raise money for the newly created Welsh corps and the other objective was to boost morale, and change public opinion about the war at home (Attenborough). Creating a children’s gift book is an effective way to fulfill both of these objectives. This was done by creating an anthology that included stories, poems, songs, and paintings that are about patriotism, and bravery. Including all of these works in an anthology for children is a good idea because in times of financial strain people are more likely to buy a gift for a child than anyone else, thus resulting in more sales of the book and more money raised. In 1915 with all the pro war propaganda everyone is looking for a way to help the war efforts, and would thus be compelled to buy this book knowing that all of the proceeds are going to the national fund for Welsh troops. The publishers were hoping that the children or their parents would read the book and feel a sense of national pride due to the tales of bravery and want to do more to help the war efforts. The foreword written by Margret Lloyd George states that any reader who is moved to donate a separate contribution to the National Fund for Welsh Troops would be acknowledged by Mrs. George. Since most children do not have any money of their own, she was hoping that parents would read it with their kids and after reading the stimulating tales about bravery and the beautiful Welsh country side that they would feel inclined to donate more money to help the troops and do their part to help the war effort. She then writes “I commend this book to every Welshman the world over” to appeal to the Welsh people’s sense of unity and nationality. This book features beautiful stories, paintings, and songs that are used as pro war propaganda and are included in this anthology for their ability to appeal to the patriot in each reader instead of for their artistic merit. Nevertheless the book is a fascinating piece of literature and history. Hopefully the contextual background will place you in a similar mind frame as those reading it in 1915 and a sense of patriotism and bravery will boil inside you the same way it boiled in the children reading it in 1915. Attenborough, John. Living Memory : Hodder and Stoughton Publishers, 1868-1975. England. Hodder and Stoughton, 1975. Print. Baker, Chris. “The 38th (Welsh) Division in 1914-1918.” The Long, Long Trail the British Army and the Great War 1914-1918 2013 1995 : n. pag. Print. Davies, John. “The Legacy of World War One.” BBC : n. pag. Web. Wales History. Barlow, Robin. “Lloyd George’s Fight for a Homespun Welsh Army: What Is the Most Important Object in Welsh History? Today Dr ROBIN BARLOW, Aberystwyth University, Argues the Case for The ‘Brethyn Llwyd’ Uniform of the Welsh Army Corps.” Western Mail (2013): n. pag. web. Gregory, Ian, and, Jordi Henneberg. “The Railways, Urbanization, and Local Demography in England and Wales, 1825–1911.” Railways and Political Economy in Britain, France, and the United States, 1840–1950. N. p. 199–228. Print. Llansytumdwy, Ty Nweydd. “Lloyd George World War One Leader Dies.” The Washington Post 27 Mar. 1945 : 1. web. Murray, Bruce. “‘Battered and Shattered’: Lloyd George and the 1914 Budget Fiasco.” Albion: A Quarterly Journal Concerned with British Studies 23.3 (1991): 483–507. Print.